Seems like Fortnite is taking another page from Apex Legends' book: This week Fortnite developer Epic Games introduced a new respawn mechanic that sounds... oddly familiar. 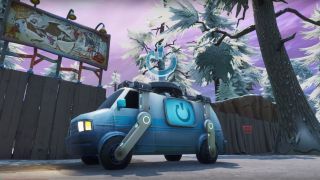 Announced in its latest Battle Royale Dev Update video, Fortnite's Reboot Van allows players to respawn an eliminated squadmate. So how does it work? Well, when a squadmate is eliminated, you simply pick up the Respawn Card they leave behind and take it to a Respawn Van. It's hard to ignore the similarities to Apex Legends' respawn beacons - one of the new battle royale's differential features that separates it from other games in the genre. Well, it did, until now. Despite Epic Games claiming its not intimidated by Respawn Entertainment's Apex Legends, with CEO Tim Sweeney even telling Venture Beat the game has "gained an Apex Legends worth of Fortnite players" since the latter's release, there's no denying the Reboot Van respawn feature seems to be shamelessly lifted from Apex Legends. Instead of collecting a downed player's flag, you collect a card and then return to a designated respawn point. Perhaps the only clear difference is the cooldown time implemented on Fortnite's respawn points. Reboot Vans and Reboot Cards will be added to Fortnite in the v8.30 update next week.